"Um... So long as you don't bring the sword?" It was more of a question than a statement. "I'd be happy to see a movie or get dinner..."
Xemnas smirked wider than the Cheshire cat when it got catnip, he scooted so that he was practically pinning Saix between himself and the wall next to the booth, "Oh, just a fine job? Oh no that won't do at all. Saix I think I'm going to make it a mission for you to flirt back." Sephiroth squealed, "Masamune? My baby?! I can't leave her! She's a part of me!" His expression turned grim, "How DARE you ask that of me WOMAN!!!" Aerith had to be honest at this point. "I want to be sure you aren't going to murder me," she said bluntly, "and I know that you'd use Masamune to do it, if you decided to." "Now now, that is no way to treat a true lady. As a nobel, I'm afriad I cannot allow your behavior," He said smirking, "I suggest you back down now. I'm Hector the Havoc. As my title states, I can easily take you down. So, you should take you and your pathetic self out of this girl's presence." "By the look of it, haven't you broken enough things? 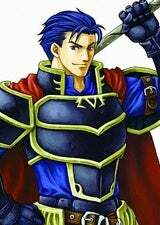 I'm Lord Eliwood of Preasea With my brain, I can easily plan an attack that could take you down, working with Hector all these years, we could defeat a rude person such as yourself. Now then, I suggest you be a real gentlemen, stand down, and leave this woman alone." "Eh?" Oh great. This would be bad. "Um... I'd appreciate it if you didn't fight in the shop..." she said, though she had the feeling her words would go unheeded. Sephiroth smirked, "Oh, now this is just what Mother wanted." An insane cackle broke from his throat, "I will teach you the meaning of true despair you fools!" He drew Masamune in a threatening manner, dark clouds started to gather outside, cue wind as well. Aerith sighed. There'd be only one way to reach these three. She drew her staff from no where and smacked all three upside the head. "If you are going to fight, go outside. Now. I would like to have my shop more than just an hour." "You won't be able to threaten women anymore." "Excuse me for a moment," He said, then was dragged out. He watched as Hector broke out his sword, he sighed putting away his sword, "Well at least you didn't attack him. I suppose we should return inside now." Sephiroth smirked at the two men, not moving whatsoever. He raised one hand effortlessly, saying just one word, "Meteor." Said meteor crashed down, killing both men instantly, "Yeah, take that b*tches." He twirled his fingers and Masamune regenerated itself, "I'm as close to God as someone can get, you CANNOT kill me." Random pedestrian, "Except if you're Cloud!" 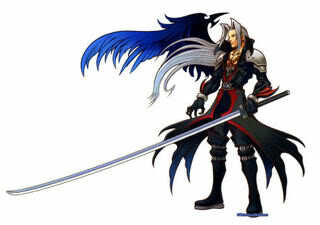 Sephiroth stabbed the man, killing him, "Shut up." Demyx, after being pushed aside by the scary 'Seffie Cloth', had what looked to be the beginning of tears in his cerulean eyes as he sniffled. "That wasn't very nice..." the musician turned waiter whispered, not loud enough for the psycho to hear him. He walked to the counter and sat on an empty barstool, sniffling every so often, chest heaving with his withheld sobs racking his slim frame. 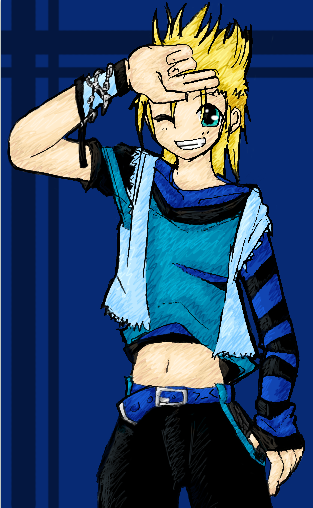 After a few minutes however, the blond wiped his eyes and looked at the scene unfolding before him. "Oh no!" Demyx exclaimed and hopped down from his seat at the counter "Superior! Superior!" he called and as if on cue slipped on a small puddle of water and fell on his face, he got up wiped his face and ran to the table a third time. "Superior, it's so bad!" He began, nose bleeding now from the previous face-to-floor contact, but he went on. "First that meanie was rude to you and Puppy and then he pushed me out of the way, and-and then he said he'd kill Aerith if she didn't go out with him and then I fell down and got an owwie and it hurts and it's all- so t-te-terribleeee" He whined hugging Xemnas around his waist like a child would a parent in a time of distress. "Please help Ms Aerith, she-she's so small and he's so m-me-mean and he keeps talking to his sword. He's so wierrrrrrrd~" Demyx hiccupped as he looked up to his Superior, awaiting his answer. "TT^TT"
First, Aerith slapped her forehead. Obviously, Sephiroth didn't know the meaning of the word overkill. Second, she patted Demyx on the head, telling him everything would be fine and that she'd handle it. Third, she walked outside with two Phoenix Downs and revived the two seemingly-dead-but-just-KOed Fire Emblem characters. Fourth, she whipped out her staff again and bashed Sephiroth over the head once more. "I didn't need a giant crater in front of my store!" she snapped at him. "And you didn't need to mutilate anyone. A simple normal fist fight or a game of Rock, Paper, Scizzors would have sufficed!" Xemnas raised an eyebrow, he sighed, 'Cockblocked again.....why did I let Demyx join, he's like a child', he gently patted Demyx on the head, using Cure on him so he would stop crying, "Demyx you're representing the Organization, remember that." Sephiroth covered his mouth in with a fake gasp then he grinned, "TEE HEEE! I'm sooo evil it hurts." "I-I know it's just he's such a weirdo and he's not very nice either." The Nocturne admitted softly, letting his leader loose. Demyx stood up, "I'll go clean up the water." he said, a simle on his face as he went over to the little collection of water that had spread out and seperated when he slipped on it. "If you come with me you won't get stepped on anymore I promise..." the teen whispered using his mastery over the element to pull it from the tile and into his upturned palms. When he had all of it he walked over to one of the few potted plants and watered it. "Hopefully Mr. Meanie Pants won't knock over your new home. Okay, I gotta go, but I'll come back for you after work. No hard feelings~. " Demyx walked over to the brunette to whisper in her ear. "Can we trade customers?" He pleaded softly giving, her the puppy poutwhich he'd recently perfected thanks to Saix. "Pwease?" "Man, I wasn't expecting a mage either. Geez, now a days people tend to take on more then one skill, eh," He said looking at Eliwood. Eliwood and he were both classic fighters, meaning they only mastered one techinque, "Oh well. At this point I guess it doesn't matter with battles we win or lose, after all, in our sparring we've had 31 matches, 13 I won, 13 you won, and 5 were draws." 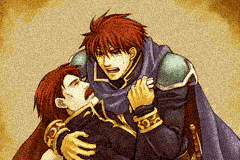 He said standing up, extending a hand to help Eliwood up as well. "Don't think I'm lying afterall, whose snoring shook the rafters in numbers class?" "Um, are you two okay?" Aerith asked after smacking Sephiroth with her staff once more for her shop's sake. "I hope he didn't hurt you too much." She cast a few curaga spells on them, just to be sure. Xemnas looked over at Sephiroth with an eyebrow raised as he re-entered the shop and popped down back in the same seat across from them.....AGAIN. He looked to Saix, "I think he'd make a nice nobody, don't you?" Sephiroth ran a hand through his silver hair, "Yo know, sometimes I feel like Cloud is the only one who understands me Mother." "Yes, Superior." Saix said, looking at the clock on the shop's wall. "I am afraid I have to go, Sir. My break is over." 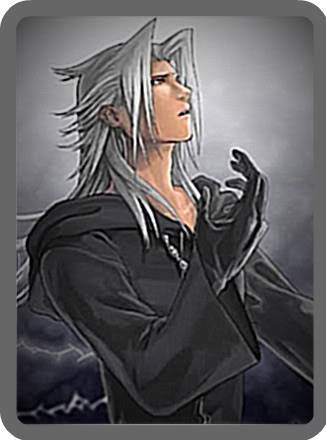 Xemnas sighed and pouted, "That's too bad, I'll see you back at the castle later. Keep the others in line." He stood up to allow the Diviner out of the booth, casting him a longing look. "Now then, I hope you don't mind us returning, as customers of course." He said winking. "No, please don't be concerned, although I'm touched you are. As strangers, I'm surprised you are able to show much compassion, due to violence that has occured in the past," He said extending his hand, "Allow me to propertly introduce myself, I'm Eliwood of Phrae. And you are?" Aerith felt herself blush slightly. "I'm Aerith. It's a pleasure to meet you, Eliwood. Of course you both are allowed to come into the shop." She didn't have the heart to tell them that the only reason she was concerned was because Sephiroth's kills had the tendency to stay dead, even with a phoenix down. "Great! Because I need some sweets! I actually recently got home from an expedition, which of course, during those you have to hunt for your own food, so, it'll be nice to have it perpared for me again." He said entering taking Aerith's hand walking her right in and pulling in Eliwood with the other free hand. "It's a lovely name," He said before he was pulled into the shop by his best friend, "Ahh, no need to be so rough." He said, trying not to sound like he was complaining, once he sat down once Hector had dragged he and Aerith to a table. "Maybe you could join us, I owe you after all." Hector said winking once more. "Maybe you could join us, I owe you after all." "Eh? Oh, um," she glanced around the shop and saw that only Sephiroth and her two employees remained. There wouldn't be anything else for her to do until someone else walked in. "I guess I'll join you then. What can I get for you to eat or drink?" she asked politely. "Alright! I knew you would, afterall a pretty lady is a kind one," He complimented and thought about what he would like. He liked really sweet things, so he had to think for a few moments, "How about I order us all a really big strawberry shortcake? That way we can all share it...and then...a pitcher of lemonade to also share! Not to mention, it's all on me!" "I hope you enjoy our company as much as we will surely enjoy yours." Well, Aerith would do her best to enjoy their company. She did have to worry about Sephiroth destroying her store some more, after all. "I'll get the cake and lemonade right away." She walked over to the kitchen, got the order together, than brought it out. She had to say, she was rather proud of her strawberry cake. It had smelled delicious while baking and looked even more delicious after it had been decorated. Aerith set the cake down on the table and cut it into pieces for them all to share, making Hector's the biggest because he seemed like the biggest eater in the bunch. Then she sat down with them and smiled. "I hope you both like the cake."